ADAM’S NOTE: Have you gotten sidetracked from your bilingual quest? In this encouraging guest post, Keli Garcia Allen offers helpful advice for when you lose your rhythm and aren’t using the target language actively enough with your kids. Thank you for today’s dose of inspiration, Keli! Meanwhile, Keli is also involved in an exciting new app project: “Spanish Safari, an iOS game expertly designed to teach Spanish to children 5-9 years old.” If Spanish is your target language, or you’d like to lend your support to a worthy project, please see the crowdfunding campaign for Spanish Safari, now taking place at IndieGogo. 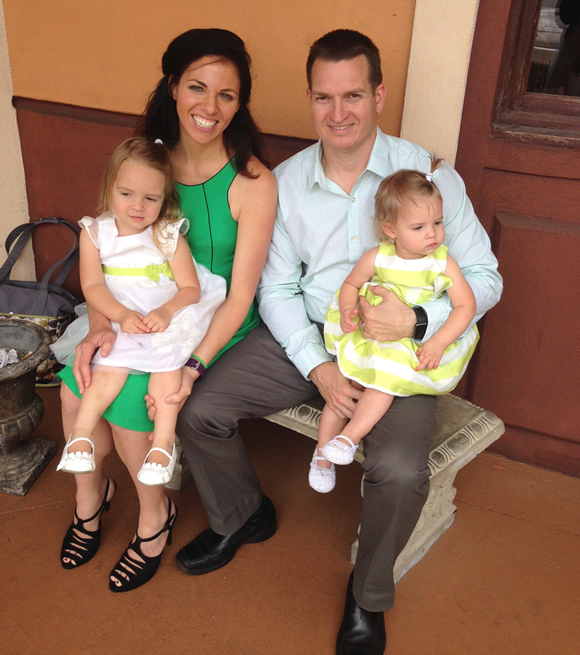 Keli Garcia Allen is a certified Spanish teacher and works as a preschool teacher in a bilingual classroom. She is the Head of Content for Learn Safari and is currently working on Spanish Safari, a Spanish learning game for children 5-9 years old. Follow Keli and the rest of the Learn Safari team at their website or on Facebook. As any parent raising multilingual children well knows, teaching kids multiple languages takes hard work and dedication. It can be a frustrating, but extremely rewarding journey. The ways in which parents work to ensure that their children learn two or more languages are varied and can involve “one parent, one language” (OPOL), “minority language at home” (ml@h), or even completely bilingual households. Once parents make these choices, however, it isn’t smooth sailing from there. Often, our language plans can be completely derailed! So, what do you do? Simply give up? Of course not! In this article I’ll share a few tips and tricks to reboot your language use and get you back on track to achieving your language goals. The inspiration for my guest post is very personal and very recent. I’m in the midst of this struggle myself! In order for you to better understand where I’m coming from, I’ll give you a little background. I’m originally from Maracaibo, Venezuela and was raised in both English and Spanish. My parents, in fact, unconsciously practiced OPOL. My mother, a U.S. native, always spoke to me in English and my father, a Venezuelan native, always spoke to me in Spanish, as that’s simply what came naturally to them. I’ve been living in the U.S. since I was 12, but I always kept up with both languages and have worked as a Spanish teacher, translator, and now am the Head of Content for Learn Safari. I have two daughters, one is 3 and the other is almost 2, and I’m raising them to be bilingual as well. My husband is a native English speaker who has some knowledge of Spanish (but no confidence in the language…yet!). So it mainly falls to me to provide the language exposure and remind my Spanish-speaking family and friends to also speak to them in Spanish! However, when it comes to language, my brain pretty much functions in whatever language is around me. If I’m around Spanish-speaking people, my thoughts are in Spanish and I’ll automatically use that language. But if I’m around monolingual English speakers, the opposite is true. Recently, we went to a family wedding (my husband’s side of the family) and spent a week in a setting with no other Spanish speakers. To be honest, I just completely stopped using Spanish with my daughters and they stopped using Spanish with me. It only took one week for this to happen! I was pretty upset with myself, but I quickly realized that I had to bounce back and refocus my efforts. What I needed was a language reboot. The first thing I did was set an hour of time every day in which we would focus solely on Spanish. This step was for my benefit, too, because if I made an achievable goal that I could stick to each day, I would be able to jump-start our use of Spanish without feeling overwhelmed. For me, the goal was to get ourselves thinking in Spanish again and if I set a certain amount of time when we HAD to do this, it would help us transition back to using Spanish all the time. Now, an hour in the evenings worked well for us, but the amount of time must suit your own family. Maybe you have only 30 minutes. Maybe you want to do several sets of 15 or 20 minutes a day. The amount of time will depend on the level of resistance you meet (I’ve come across situations where a child gets very emotional about having to use the target language or they simply refuse to do so) and the amount of time you can focus on this aim (sometimes, with so much on our plate, we have to cut ourselves some slack). The point is, we should set an achievable goal, no matter how small, and get started today! During this set time, I chose to pursue some of my favorite language-learning activities with my daughters and I think you’ll find, with some adjustment as needed, that these will work for any language and any level of speaker. I know, I know. It’s almost like cheating. But it seriously works! Watch a short cartoon or use an app in the target language for a few minutes. It’s a super fun and stress-free way to get all of you thinking in the target language. Don’t simply be a passive observer, though. Use the time to talk about what you see and hear. Repeat what the characters are saying and ask a lot of questions about what’s happening—all in the target language, of course. We should be reading to our kids every day, but sometimes we fall out of this habit. Or maybe you’re reading every day, but not in the target language. This can be especially true when children are in school and already have a lot of homework and reading assignments. However, this time together is a great opportunity to grab a book in the target language and read. Try to read in the target language at least three times a week in order to enrich comprehension and vocabulary. Art is great for humans of any age! For children, though, it can be a powerful conduit for self-expression. Let your kids draw or paint and have them tell you about what they’re doing. Once they’re done, ask them to write about their art. If they can’t write yet, let them dictate it to you as you write it down. Encourage them to tell you about it in the target language. You may have to supply some of the words for them or even translate it for them if they don’t know the correct word. Keep a positive attitude and smile a lot while you do this and your children won’t feel bad about not knowing the right words. During your language time, practice your target language by simply having conversations as a family in that language. Use self-talk, when you describe everything that you’re doing, and also use parallel talk, when you describe what your child is doing. The beauty of these two types of conversation is that they can be practiced while you’re cooking dinner, giving baths, doing chores, or playing games. Another technique involves asking the child a lot of questions, especially open-ended questions, which provides an opportunity to think in the target language and formulate a response. A few days after I refocused my efforts, setting an hour each day for us to use the target language, the dynamic changed completely! This really did help reboot our language use and we were able to resume speaking mostly in Spanish to each other. I know that our time away from using Spanish was brief, but it made me realize just how quickly and easily we can lose our use of a language. 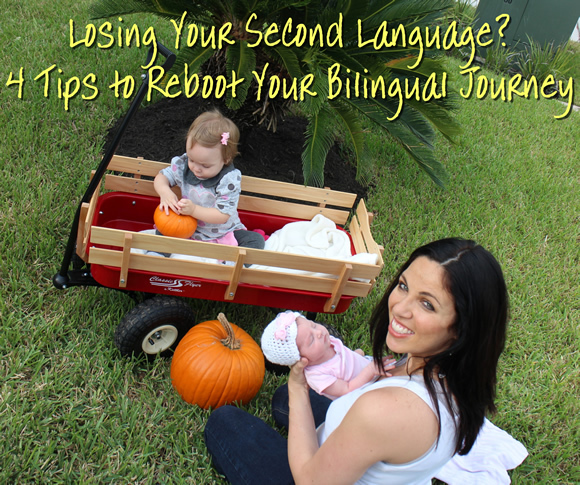 However, even if you haven’t been using your target language for months, or even years, it’s never too late to give yourself a reboot! By establishing that special language hour (or even language minutes, depending on your kids’ level of interest) and using some of the techniques I outlined above, I bet you’ll start making progress again! Language learning is forever, so don’t let a few weeks or months (heck, even years!) get you down. Instead of beating yourself up over the past, get back in the game and try making a new future for your family! How about you? Do you have any tips or tricks for rebooting the use of your target language? Thank you for this post! These are great ideas. Three years ago, we spent a year in Austria to be close to my husband’s family and get our two daughters to finally speak German. It took a while but worked! Both were completely fluent in German after just a few months. (Our older daughter could even speak the local dialect when she wanted to.) But it only took a couple of weeks after our return to the States for them to stop using German altogether. Their passive understanding is still great. But they refuse to speak. I look forward to trying this “reboot”! Hey Lisa! I’m glad you enjoyed the post. It seems that our babies can just be so stubborn! I hope that these tips work for you and we would all love to hear about what works and what doesn’t for your family! Hi Keli (and Adam), I have a question. Not sure if you have managed to download apps from your second language country? Since my kids have recently discovered an affinity for my husband’s tablet, I thought I would try downloading a couple of German apps. However, when I downloaded one, it somehow installed the English version of the app instead of the German. Any suggestions? Fwiw, we use a tablet (Android), not iPhone… Thanks in advance for any suggestions! It sounds like it’s a problem with the web developer! They might have the wrong language installed. The best thing to do would be to try to contact them! I am not sure if you are allowed to so directly from Android, but they should have a website! I am sorry that happened. Thanks Keli! I will try that!